We continue with more photos and original captions from the Oregon State University Archives. View Part 1 here. The captions provide a fascinating commentary on historical understanding of areas in the Holy Land a century ago, including a comment about "Jewish Zionists." The pictures are dated as "circa 1910." View the Oregon State University Archives' complete collection here. The Archives' captions appear in blue below. Golden Gate image (above] description from historic lecture booklet: "The Golden Gate is in the East wall of the Haram or temple area. Ezekiel, the prophet, says that it was shut in his day and must not be opened for any man, "for the Lord, the God of Israel hath entered in by it , therefore it shall be shut." Ezekiel 44:1,2. 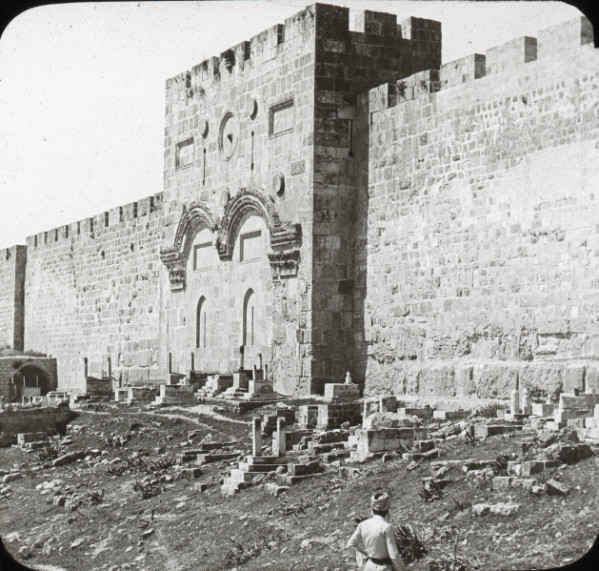 Traditionally, this is the Beautiful Gate of Acts 3:2, but that gate was evidently much nearer to the Temple. But actually dates from the fifth or perhaps the seventh, Christian century. It was restored in 1892; it is still architecturally interesting from the inside, where a staircase ascends to the roof." "One of the handsome southern approaches to the mosque of Omar, a Mohammedan temple of religion. The mosque is on the higher level. 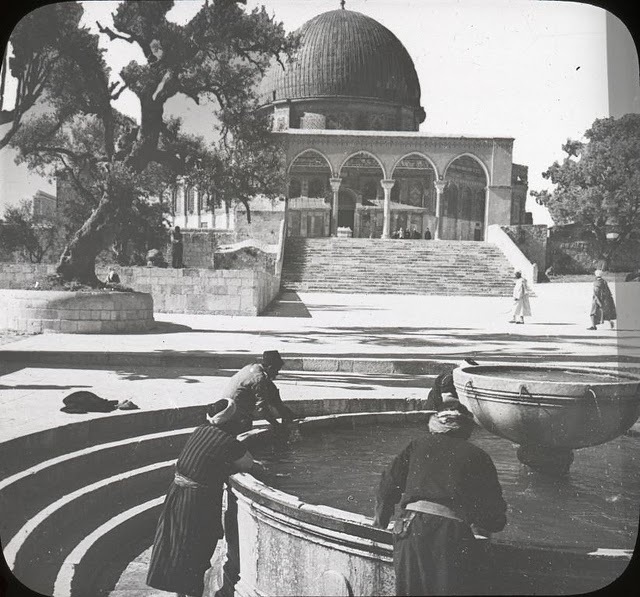 In the immediate foregrounds is one of the famous fountains of the Temple area, and men may be seen at their religious ablutions. When one reaches the approach it is necessary to rent slippers. They are always kept on hand for the purpose of entering the Mosque and are retained until the visitor finished not only the Mosque of Omar, but also the Mosque el-Aksa on the south end of the area. This is an act of reverence just as we would remove our hats when going into a church." deeper than those seen in other photos of the surface. "This rock has been regarded as sacred from the earliest times. Long before the Hebrew occupation of Palestine [Editor's note: some 3,500 years ago], this striking formation led the ancients to view this as a Holy mount. Its length is about 58 feet, the breadth nearly 52 feet. It extends above the surrounding pavement from four to six and half feet. Here on Mount Moriah, which is called also Zion, Abraham was about to offer Isaac. Here by the threshing-floor of Araunsh, David saw the destroying angel. Here also Solomen [sic] built the temple, but this rock was not within it as it is within the Mosque. It is probable that the altar of sacrifice stood on the rock. The interior of the Mosque, which is an octagon with sides 66 feet 7 inches in length, is 174 feet in diameter. It is divided by its two series of supports into three concentric parts. The pillars were all taken from older buildings. 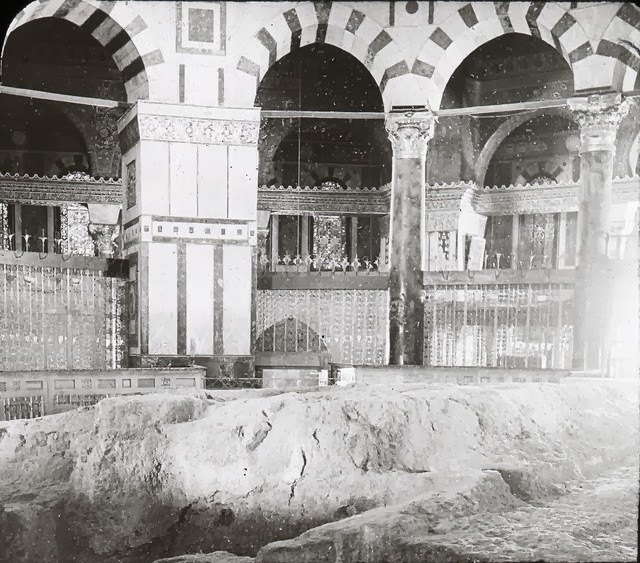 An inscription in the oldest Arabic character, Cufic, records that "Adballah el-Iman el-Melik, prince of the faithful erected this dome in the year 72-692 A.D.["] It is in the Arabian style." "About ten miles northwest of the Sea of Galilee on a very high hill (2,749 feet) of the ancient province of Galilee, is situated the city of Safed, which is thought by some to be the city referred to by Jesus in His sermon on the mount (Matt 5:14). You remember the words of our Lord to his disciples in the Sermon on the Mount? "Ye are the light of the world. A city that is set on a hill cannot be hid." He may have pointed to this very hill and this very city, now known as Safed, in northern Galilee. Although no place having this location is named in the Bible, it is probable that in Christ's day, a city was standing on this hill, for in the New Testament period, this land was densely populated. 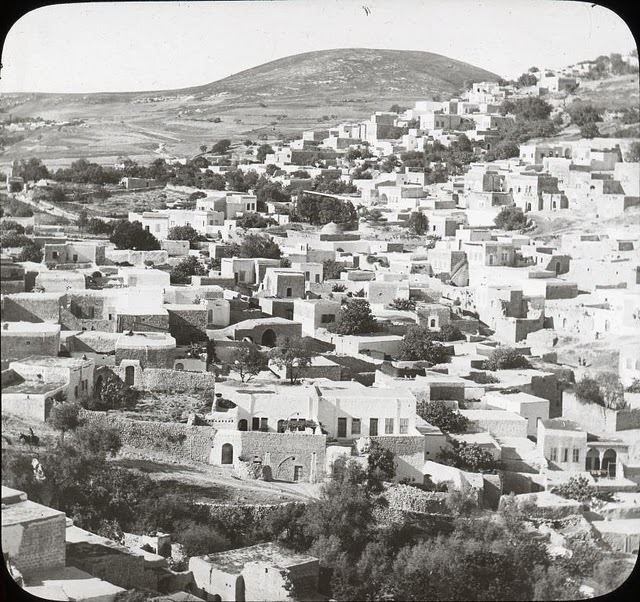 Safed stands as a landmark, seen in every direction, and well illustrated the words of Jesus regarding the prominence of his disciples in the world." 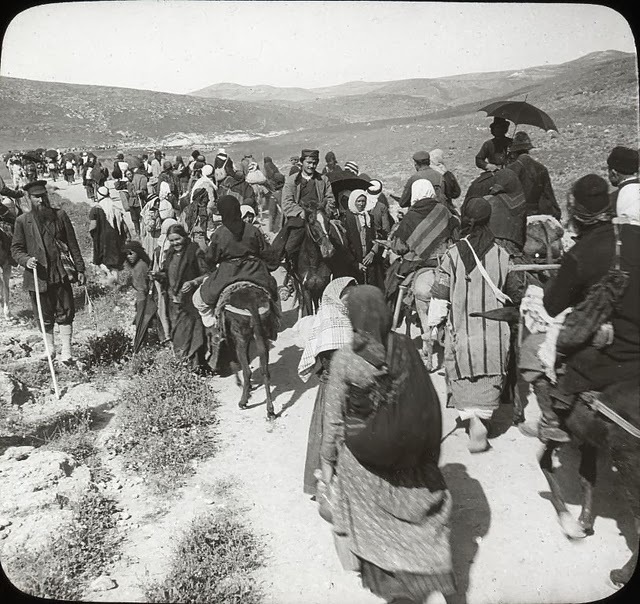 "This picture is taken along the Jericho road looking west toward Jerusalem. The subject of the picture "Pilgrims" is one that has its place in all histories of religion. The present motley crowd is made up of a number of nationalities, but the majority are Russians. These have already been to the Jordon at their reputed places of the baptism of Jesus. and are now returning to the Holy City to partake in the festivities around the Holy Sepulchre which takes place at Easter." Image description from historic lecture booklet: "Christian Street is a thoroughfare running north and south ending at David Street. It is by far the cleanest street in all Jerusalem. There is a new "Jerusalem" now being built by the Jewish Zionists, who are settling in Palestine in great numbers. They are establishing a university and are spending millions of dollars in modernizing the city and whole region." 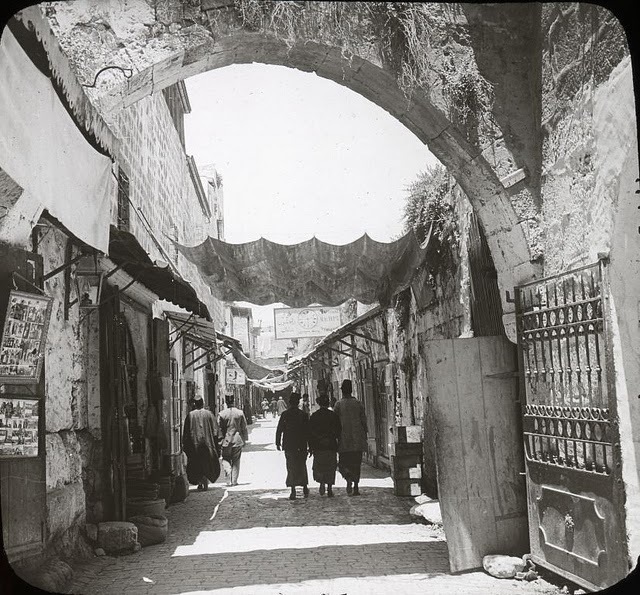 "A good macadamized road extends from Jaffa to Jerusalem. 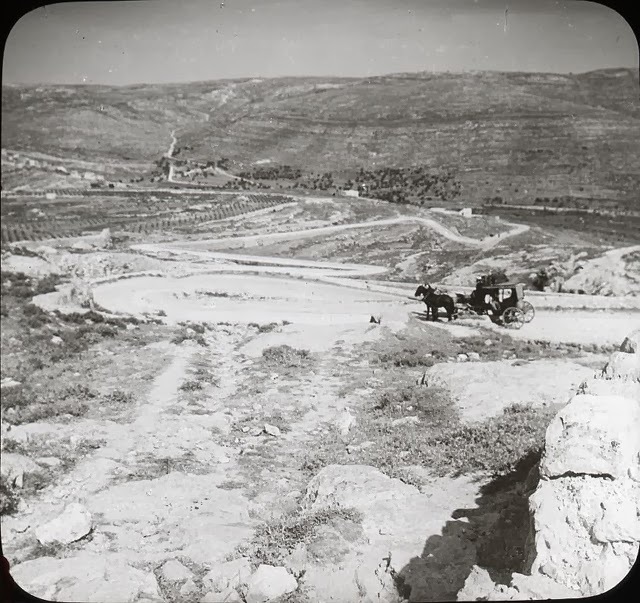 The section of road in the picture with its serpentine windings is six or eight miles from Jerusalem." Click on pictures to enlarge. Click on captions to view the original picture. I am a subscriber in Oregon. I had no idea that Oregon State University held such such treasures. Such archives are surely a map of the march of time and restoration of the land and people of the book.